Douglas R Witt did a Public Service Alliance of Canada Mask Workshop and made some pretty amazing masks made from cardboard. I wanted to share because I know that you could certainly appreciate it. This may not be a project for your children to complete, but one you could make and the children could use in dramatic play. Making an even sided mask template is an easy thing to do. 1.) 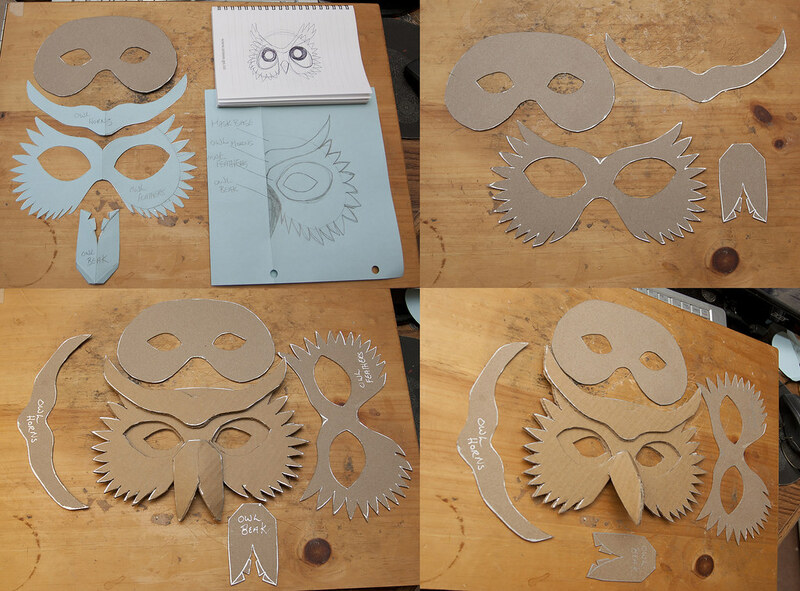 Use a piece of paper and draw out the shape of the mask you want and then cut it out. 2.) Hold the paper mask up to your face to make sure it sits on the bridge of your nose comfortable. While holding the template to your face, tap on the front of the mask to find the eyes. With a felt pen, mark where the eyes are roughly. 3.) Remove from face. Draw in eye shapes and cut it out with a pen knife exacto blade. 4.) Put the template up to your face. Pick a side you like best. You never get the template exactly correct the first time. 5.) Cut the mask in half. Keep the side you like. 7.) 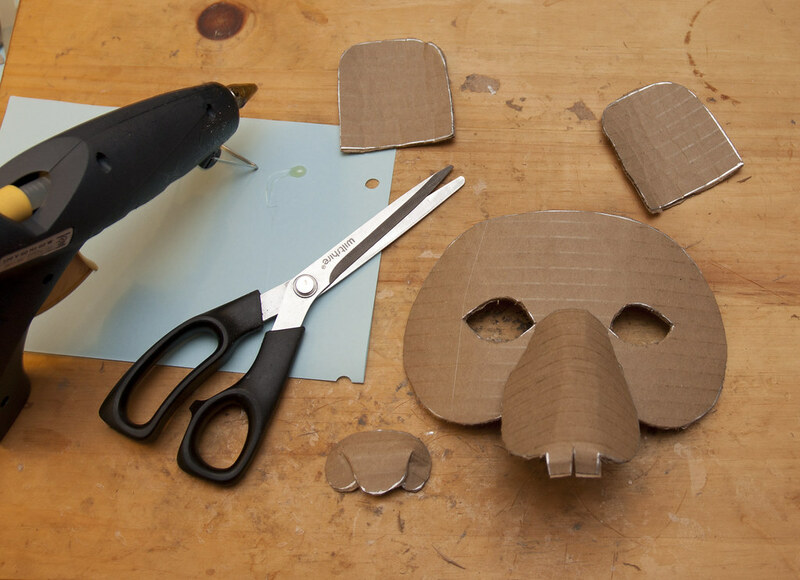 Take another full sheet of paper and fold it in half, and repeat the same trick as before to create symmetry with your mask so that your mask will have the same size ears or whatever features you want to make for your mask. 8.) Basically what he did as shape the test templates and fit them together and glued the mask together with hot glue to see how the end mask will look. You will see over the next few photos how that was done. 9.) He added some funny looking tags to the snout piece as you can see in the bottom right corner. He did this because he folds them under the snout and use them to attach the face part of the mask and the nose. 11.) He gently curves all the face pieces. You do this by hand, on the edge of a table or by using a broom handle. Keep in mind do this carefully… you only want a slight curve and you don’t want to mangle all your hard work. 12.) 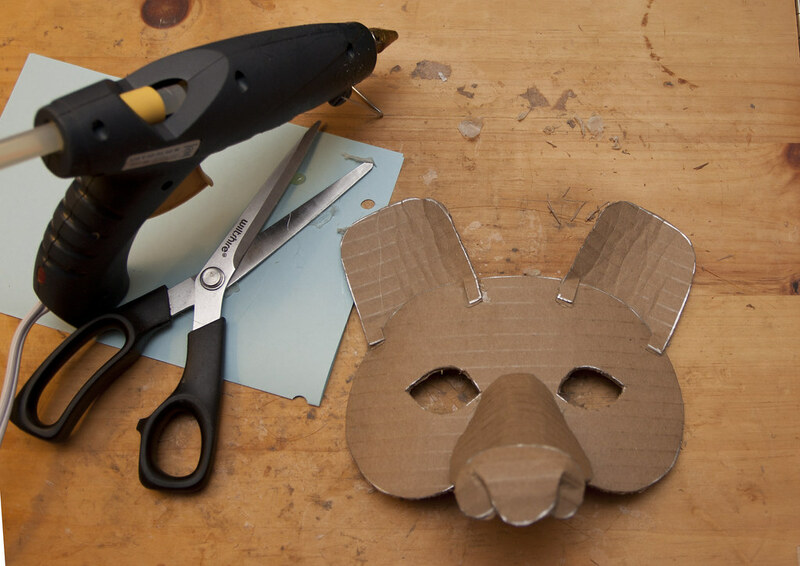 He assembled the mask with a hot glue gun… using as little glue as possible. 13.) He made to little slits in the corners of each ear so that he could use them to hot glue the ears to the mask. 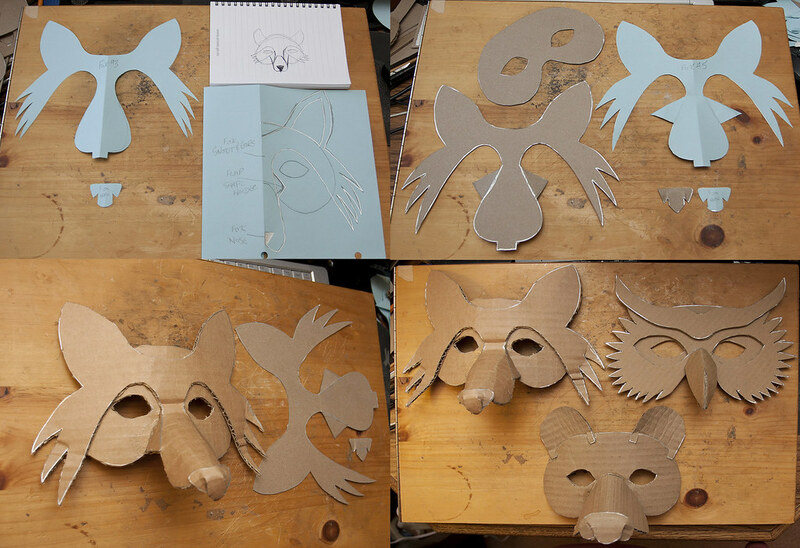 Here are all the masks he created using this method. 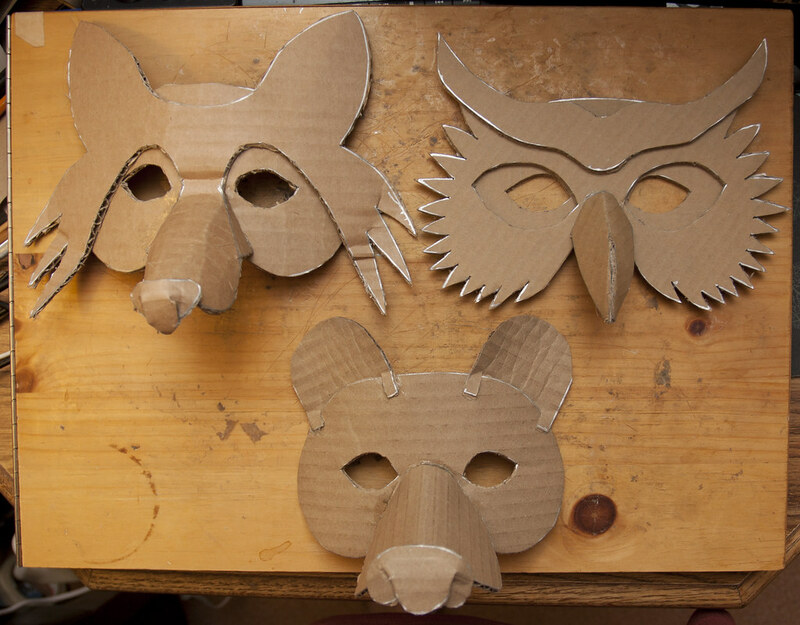 As you can see, you can make just about any type of mask for your play area. After the masks are created, you add a stick to the back and paint them.